I forgot to ask about this. In May, I went to the Fbody Gathering in Atlanta. My car was judged and I was informed that I was missing the underdash plastics. I've spoken to a few people that have commented that they only had one side or that neither side was on their car either. I'm looking for original owners that know for a fact their car had 'em, didn't have 'em or was only on 1 side. The thing that has me wondering is, the plastic cover is what holds the underdash courtesy lights in place, right? My car has a metal bracket on both sides that holds the light. This is what makes me think my car never had 'em. Please let me know. To my knowledge, those are called hush panels. I have them both on my 89, but then I'm not the original owner, so they could've been added, but at the same time, I have no metal brackets. they mount directly into the plastic hush panels. For the record, I'm interested in figuring this out too. Can you get a picture?? I bought an 85 Camaro back in 86--car had 10,000 miles. Car was a stripper--4cyl, rear defrost and auto trans w/the ers radio--that was it. Car came w/no hush panels on it. I think it probably came like that since I don't think anyone would bother taking them off. You must live and breath these cars, particularly 87's. My car has the panels, but no courtesy lights, because I don't have that option. My buddy's 87 with a 350 doesn't have the panels but has the lights. 87s, but only Camaros!! My favorite year. One other point I neglected to mention earlier. When equipped with the hush panels, the ALDL connector is covered by a flat, rectangular black plastic plate (below left) that snaps onto the hush panel. 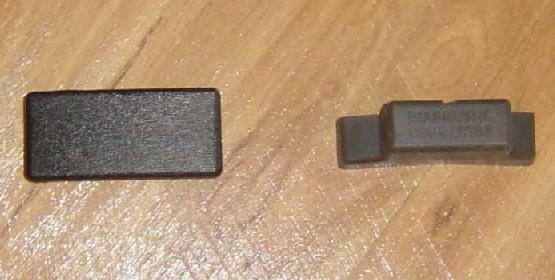 On 350 cars without the panels, the connector is covered by a form-fitted, black plastic cap with print, "DIAGNOSTIC CONNECTOR" (below right). 87 Camaro is my favorite year also. Mine too!! I still don't know what you guys mean about this light panel thing though and I wonder why they changed that cover. Thanks Willie. Now I don't need to spend the money to find these. I'm very impressed with what you know. The reason they changed the cover was because the plastics covered the plug and the flat cover was just an access door to the ALDL. Without the plastics, the plug would be fully exposed and the form fit cover would protect it. Below is a pic of the drivers side and passenger side under my dash. No plastics, but the lights have a bracket. Wow, I thought that's what you guys were talking about, I wonder what the deal is?! Both my 84 Z28 and 89 TTA have those panels on the car. Memory is a little vague, but wasn't there a quiet group as an option? Maybe part of that option package. I have an idea. Scott's pics helped to form this idea. Maybe, just maybe the hush panels can't be installed with those Delco Bose front speaker kick panels. I know the '87 350 IROC-Z (I used to own it) and the '88 350 IROC-Z both had Delco Bose. Maybe it's NOT a 350 connection, but a Delco Bose one instead...... Now we need to take a poll of guys with the original Delco Bose system I suppose. I was gonna metion that. I bet it does have something to do with the Bose!! All my Firebirds have/had the panels. yea my 89 iroc has them. no bose stereo. My 87 SportCoupe didn't come with hush panels, but Moms 92 RS & my Bro's 84 Berlie did... I was going to suggest that maybe it was part of the custom cloth interior? I have since added the hush panels on my car. My car is fully optioned. It has the custom interior and also was upgraded to leather. I'm beginning to believe Willie's theory that it might be related to the Kick panel amplifiers. My car is a 83 L69 (duh) Z28. It has the optional interior and upgraded radio for that year, but not the one that swings out. It has the hush panels on both sides, with courtesy lights. My ALDL is covered with the plastic cover, seems like it has "Diagnostic Connector" cast into it. Being a 83, I don't have the RPO list, so I don't know what sort of packages it might have been equipped with. I can snap some pics later on if you want them. If the car didn't have the option, how were the hush panels handled? Mine doesn't have the lights (didn't know they were an option, I just figured someone cut them out), so I have uncovered holes where the lights would normally be. Is that how they came from the factory or had some sort of filler? Wow... that's interresting. I just assumed that all cars had the hush panels. All 4 of mine have, although none had Bose nor the L98. My 88 IROC-Z with ERS has the panels. It seems funny that the factory couldn't just have a seperate panel for the Bose systems to fit the amps. My 88 IROC-Z has the "hush panels" and it does have the Bose sound system. I believe them to be correct because the lights mount in them and the car has not been hacked up or anything has been changed. It appears that there was no standard for having the hush panels. I think we've determined that it had nothing to do with the Bose setup in 88 on up cars, but we haven't heard from any other 87 Bose owners. Also, have we determined anything regarding engine size yet? That was Willie's first thought. My 88 IROC-Z with ERS has the panels. Yes, but ERS was practically any optional stereo, not necessarily the Delco-Bose. Do you have the DB system? It seems funny that the factory couldn't just have a seperate panel for the Bose systems to fit the amps. Also, have we determined anything regarding engine size yet? That was Willie's first thought. So far, the results are consistent: 350 = no panels. We need to hear from more 350 owners. Scott, why don't you start a new thread calling out 350 owners. Then post your pic(s) again to illustrate how a "no-panel" car looks like. I bet you'll get a much better sampling. Yeah sorry should have been more specific, it's just the Equalizer tape head unit with power antenna. both of my 84's (sport coupe and z28) have the panels. they're roughly 2 months apart in production, and both have the upgraded interiors with the custom cloth and adjustable headrests. i have an 87 z28. not bose, 305, and i have the light brackets and no hush panels. i tried buying som but it restricts the movement of my foot from the gas to the brake and it also didnt mount right. the passenger side is fine but i am going back to just the brackets. My 87 IROC has Bose speakers and underdash panels. Car was built in Jan 87 in Van Nuys. I will attach two photos. One with this post, and the other in a following post. A bulb is present in the socket, and is believed at this point to be a factory-installed original bulb. The bulb lights, but light does not reach the floor. Here is back side of panel. Bulb socket is plastic. Do cars with metal brackets use the same plastic socket? yes. Look at the picture of mine above. You can see the bulb and socket are the same. The mount is the only thing different. willie, a friend of mine has an 87 IROC 305 TPI with the BOSE kick panels. next time i talk to him, i'll ask him if he has those panels, and then see what he says. i'm pretty sure he did have them, though. Previous 84 LG4 sport coupe with no hush panels. I never found the RPOs for it, but it came with A/C, U79 audio package, manual windows locks & hatch, and no courtesy lights on the floor, under the hood, or in the hatch. 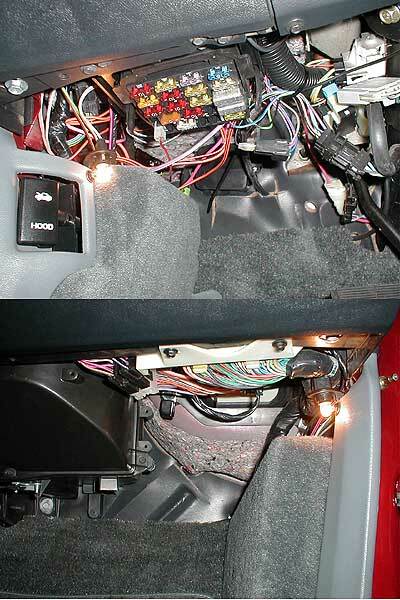 My 86 Firebird 2.8, stripped down to the only options it has is Air and cruise (not even delay wipers) with the old AM/FM non cassette radio has the hushpanels, but only has the light on the drivers side with a place to put the bulb, the provisioning is on the passenger side for a light, but it is not there. So there's another funky setup that GM did. Just had a thought about this (not willing to give up); do those of you with the hush panels also have carpetted lower center consoles? Mine does!!!!!!!!!! I also have the carpeted trim pieces in the rear. No, on mine it was "B18" & "B48" interior trim deluxe. My 87 TA has the panels on both sides and has the courtesy lights on both sides. I took the one off from under the driver side since my shoe always seemed to rub against it. I was too lazy to do that, I just took my shoe off. Best bug repellant I ever had in the car. '87 350 IROC not BOSE, has huse panels, Norwood car, custom cloth, aldl cover on the left in the picture. Original owner. Last edited by 87350IROC; 08-01-2004 at 03:59 PM. '87 350 IROC not BOSE, has huse panels, Norwood car, custom cloth, aldl cover on the left. Original owner. Do you have any RPOs? sure what are you looking for, radio codes, interior, engine? I don't think there is a special code for hush panels, but i could be wrong. I'm not on my home computer now so i can't post a pic of it if you don't believe me. But i can later tonight. Last edited by BaddAzzRS; 08-06-2004 at 04:45 PM. Anything that might pertain to the interior. There definitely isn't a seperate RPO for them, but it would be cool to find out what RPOs included them. I know for a fact hush panels didn't come with the bose system because the pass. side hush panel light will smash against the bose kick panel & melt the carpet on it lol. I've tried this once when I swapped interiors and my friend had the bose system, he did not have the hush panels. I did. Last edited by 85VortecTA; 08-07-2004 at 05:43 PM.